What are the three components of the formula? How do they work? What does "full funding" mean? How far along is the state? How will the funding formula be phased in? Why does funding vary by district? How is money allocated under the formula? How must districts spend LCFF dollars? How should districts calculate yearly allocations? How restrictive are targeted dollars? How do incentives for smaller K-3 class sizes work? What happened to transportation funding? What’s left out of the formula? What is a Local Control and Accountability Plan, or LCAP? What is in an LCAP? What are the LCAP’s eight priority areas? What is meaningful parent and student engagement? What is the role of the county office of education? What will the California Collaborative for Educational Excellence do? When is state intervention warranted? California's Local Control Funding Formula (LCFF) created sweeping changes in how California schools are governed and funded. This guide provides the context and the history for those changes as well as comprehensive information about how the new system works, how much money school districts receive, and which parts of the law remain to be defined and implemented. A look at how California's school spending compares with other states in our "States in Motion" guide. We welcome your comments and suggestions. Send them to edsource@edsource.org. The stakes are high. Whether the law delivers on its promise of improved academic outcomes for students will depend, in part, on the extent to which parents, teachers and community members guide local school boards and superintendents to set ambitious goals and make wise spending decisions. The Local Control Funding Formula encompasses three broad principles: funding schools more equitably, based on student needs; making more decisions at a local level; and measuring school achievement using multiple metrics, not just test scores, and supporting schools so they improve rather than punishing them for failing. The heart of the overhaul of California’s school finance system is a funding formula that offers clarity and simplicity, treats districts evenhandedly and recognizes, as Gov. Brown said in his State of the State address in January 2016, that some students need additional resources. The Local Control Funding Formula, he said, provides extra funding “to enable educators to overcome the barriers that confront non-English speaking families and those with low and very modest incomes.” The new law promises that all districts will be treated alike, based on their proportions of students targeted for extra money. The heart of the overhaul of California’s school finance system is the funding formula. When it is fully implemented, all districts will receive a uniform base amount per pupil, with different amounts depending on the grade level. Districts will receive the most funding for high school grades, where instruction costs the most, followed by funding for grades K-3, which includes incentives for smaller class sizes. (Older 4-year-olds in transitional kindergarten are treated the same as kindergartners for funding purposes.) Districts will receive less funding for students in middle grades. On top of the base grant, districts receive additional funds based on the number of low-income children, English learners, homeless students and foster children who attend. These students are referred to as “high-needs” students in this guide. Districts receive an additional 20 percent of the base – a “supplemental grant”– for each high-needs student enrolled in a district. 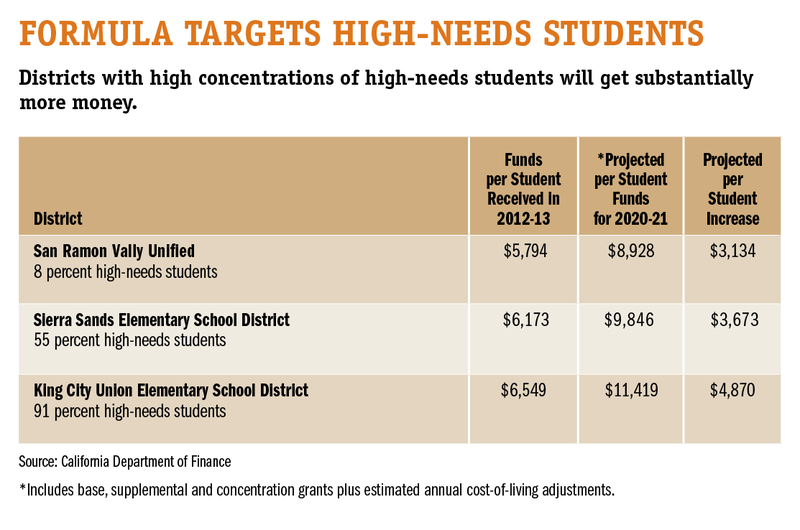 On top of that, when high-needs students make up at least 55 percent of a district’s enrollment, districts receive a “concentration grant” equal to 50 percent of the base grant for every high-needs student above the 55 percent threshold. This threshold figure was based on agreement among proponents of the new system that it costs school districts more to effectively educate high-needs students concentrated in high-poverty communities. The Local Control Funding Formula by itself creates no new sources of revenue; its provisions determine how available state revenues will be distributed to districts. 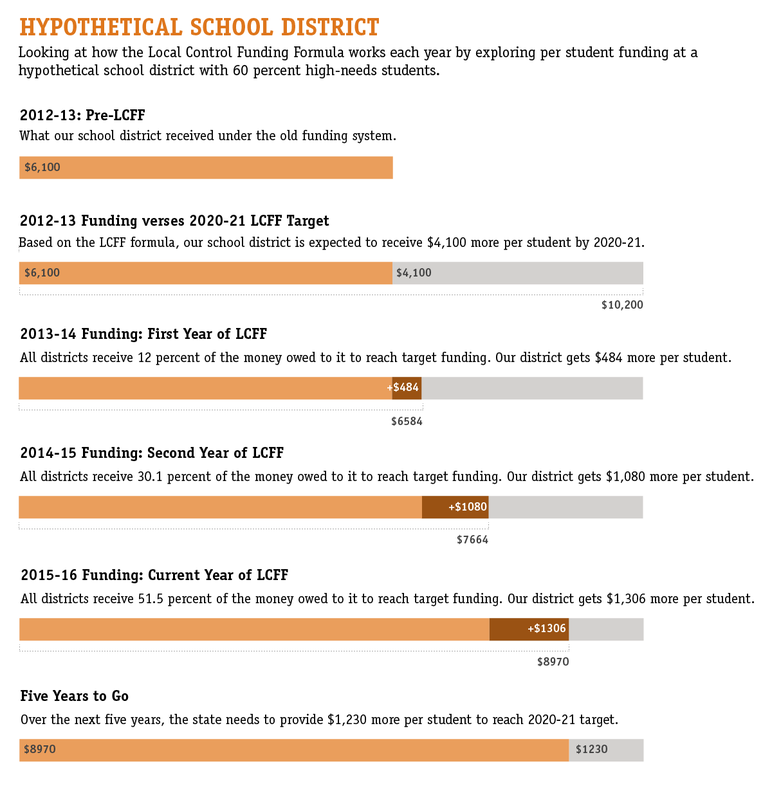 The Legislature defined “full funding” as the end of a transition period from the old revenue distribution system, in which districts were funded based on outdated formulas, to one where, with few exceptions, base funding per student would be uniform, and the proportion of high-needs students in a district would determine how much additional funding it would receive. Sixty-three percent of California’s children qualified as high-needs students in 2014-15, generating additional dollars for their districts, according to the state Department of Finance. At full implementation, all districts’ per-student funding will be at least what they received in 2007-08, the pre-recession level of funding, adjusted for inflation. Most districts’ funding will exceed that amount. The funding law further guarantees that districts will get no less than they would have gotten under the former, pre-LCFF funding system, plus inflation adjustments. About 130 of the state’s 1,000 districts that would have received more under the old system are entitled to a differential, called the Economic Recovery Target. The payments to these districts are being paid out in approximately one-eighth increments over eight years. By 2020-21, the Economic Recovery Target will become a permanent addition to what the district will receive from the state. The Department of Finance estimated it would cost about $21 billion in additional dollars to fully fund the system. The starting point was the $39 billion level of spending in 2012-13, the last year under the old system. The $6 billion for the funding formula in the 2015-16 budget will bring LCFF funding to $52.7 billion, erasing 70 percent of the gap to full funding. In the state budget that Gov. Brown has proposed for 2016-17, LCFF funding would receive $2.8 billion more, bringing the level of funding to $55.5 billion, closing 85 percent of the gap to full funding after only four years. The latest estimate of the Department of Finance puts full funding at $58.47 billion, plus future cost-of-living increases. Heading into Year 1, districts started with the per-student funding they received from the state in 2012-13 under the old system (not including funds they received for programs such as special education that are not covered by the funding formula). Each year, districts will receive a portion of the difference between their current funding and their target at full funding. This will include annual cost-of-living adjustments. To illustrate, take a hypothetical K-12 unified district where 60 percent of students are English learners and from low-income backgrounds. Let’s say the district received $6,100 per student in funding from the state in 2012-13 and is targeted to get $10,200 per student at full funding of the Local Control Funding Formula in 2020-21. Under the formula, it would receive an additional $4,100 per student in combination base-supplemental-concentration dollars by the time it reached the last year in the transition period. In 2013-14, it got $484 in additional funding – a little less than an eighth of the gap. In 2014-15 , it received $1,080 more in per student funding. In 2015-16, it will receive $1,306 per student, raising its total to $8,970 per student in three years. That leaves $1,230 per student to go. In the proposed 2016-17 state budget, released in January 2016, it would receive $606 per student more, raising its total to $9,576, about 95 percent of the way to full funding, with $624 to go, plus cost-of-living adjustments in the remaining years. With the phased-in expiration of Prop. 30 taxes, starting at the end of 2016, revenues for the LCFF are expected to slow after 2016-17. The California Teachers Association, other unions and health-care organizations are proposing an initiative for the November 2016 ballot to extend Prop. 30’s income tax on the wealthiest earners. The outcome of the initiative, along with adjustments for inflation and fluctuations in state revenue, will determine how quickly districts will reach full implementation of the formula and the final funding amounts. Districts’ per student funding under the Local Control Funding Formula varies by grade level and by the percentage of low-income, homeless and foster youths and English learners (also called Unduplicated Pupil Percentage) enrolled. This graph shows the funding level that districts will receive once the transition to the new formula is complete, which is projected to be in 20-21. The amounts will rise once future annual costs of living are included. The red line would be a unified district’s funding after averaging in amounts by grade level. Districts with all high-needs students will receive 40 percent more per student funding than districts without any students targeted for extra dollars. Funding sharply increases in districts in which at least 55 percent of students qualify for additional funding. They receive additional concentration dollars. This chart, prepared by School Services of California, Inc., doesn’t include add-ons to the formula, such as transportation funding. The previous example is representative of districts with an average percentage of high-needs students, but the numbers will vary for each of the state’s 1,000 districts. Each district is receiving different amounts in the transition period, some significantly more or less than the average. Each district started at a different point in Year 1 because each received a different per-student funding amount under the old system. And, at full funding, each district’s funding will vary, based on their proportions of high-needs students. The conversion from one system to the other is projected to take eight years. Districts that did well with categorical funding and “revenue limit” funding under the old system and have few high-needs students will get the least money as a result of the transition to the new system. Those that did poorly under the old system but have high numbers of high-needs students will get the most. School Services of California, a consulting and lobbying firm for school districts, analyzed the increases in LCFF funding for 2015-16. It found that one-third of districts would see the least – an average increase of 6.8 percent in funding over the previous year under the formula. The middle third would see an 11.9 percent funding increase. The increase for the top third would be 16.3 percent – the largest yearly percentage increase for them in decades. About 30 districts that did exceedingly well under the old system will receive funding at the 2012-13 level with no increase in 2015-16, and nearly 60 will receive an increase of 18 percent or more, School Services reports. This will consist of a base amount of $7,007 plus 10.4 percent of the base amount – $813 per student – as an incentive to keep class sizes smaller in early grades, and to cover some of the costs needed to do so. This includes a 2.6 percent addition to the base to encourage – but not require – districts to fund career technical programs such as Linked Learning, which link the middle or high school curriculum with career options. The Department of Finance and the Legislative Analyst’s Office have not published an average base rate for a unified (K-12) school district after full funding is achieved. 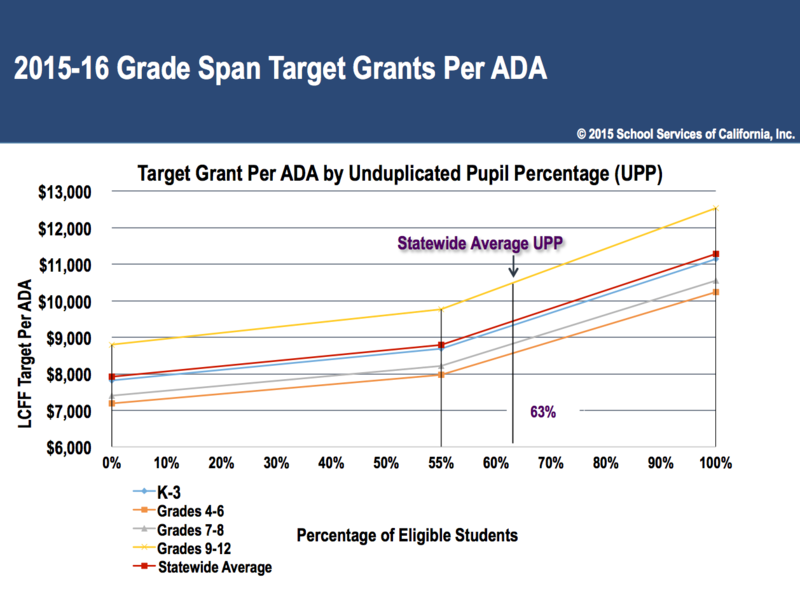 Our estimate for the average unified rate is $7,930 per student at full funding. It is based on the statewide K-12 enrollment by grade and includes three years of cost-of-living adjustments. Each district will get an additional 20 percent of the per-student base grant for every English learner, foster child, homeless youth and low-income student in attendance. For grades K-3, this will amount to an additional $1,564 per student at full funding; $1,438 for grades 4-6; $1,481 for grades 7-8; and $1,760 for high school. These amounts include the 2015-16 cost-of-living adjustment. Some students fall into more than one high-needs category. For example, about three-quarters of English learners are from low-income families. But these students will only be counted once, and districts will receive a single 20 percent supplement for each of those students, regardless of how many high-needs categories they fall into. The formula is based on what is called an “unduplicated count” of high-needs students. A student’s “low-income” status is determined by his or her eligibility for the federally subsidized free and reduced-price meals program, available to children from households with incomes up to 185 percent of the federal poverty level for a family of four who enroll in the program. In the 2015–16 school year, a student in a family of four with an annual income below $31,525 was eligible for free meals; the reduced-price income cutoff was $44,863. Since supplemental funding under the LCFF is tied to student enrollment in the meals program, many districts have conducted successful outreach to inform families of their eligibility. Districts can also use an alternative form for students who have not signed up for the federal lunch program. Districts identify students as “English learners” based on a home language survey and an English proficiency test. There is no limit in the law for the number of years a district can receive extra funds for each of its English learners. Eligibility ends when a district reclassifies an English learner as fluent English proficient; districts determine when that happens. The Department of Finance says that 63 percent of students enrolled in K-12 schools statewide currently qualify for at least one of the categories eligible for supplemental funding under the LCFF. Districts in which high-needs students make up 55 percent or more of enrollment qualify for additional “concentration” grants. The grant is intended to help address research findings showing that students face extra academic challenges if they attend schools in which their peers are also poor and struggling to learn English (see footnote 47 on page 27 in the Public Policy Institute of California's report on the LCFF for references). Districts will receive an extra 50 percent of the base grant ($3,910 per student for K-3, for example), in addition to the 20 percent supplemental grant ($1,564 per K-3 student), for those high-needs students above the 55 percent enrollment threshold. At full implementation, a district in which every student is a low-income student, English learner, foster child or homeless youth – such as Greenfield Union Elementary in Monterey County and Compton Unified near Los Angeles – will receive 42.5 percent more in per-student funding than a district with a handful of high-needs students. The 42.5 percent consists of the 20 percent supplemental funding added to the 22.5 percent extra in concentration funding. After full funding is achieved, the law guarantees that all districts will receive no less per pupil than they got in 2007-08, before the Great Recession, adjusted for inflation. Because of the passage of temporary taxes under Proposition 30 and projected increases in state revenues, most districts are forecast to receive significantly more money during the next eight years than what they were previously receiving. Those districts with the highest proportions of low-income students, English learners and homeless and foster children will receive the most. The funding law says that districts must use money from supplemental and concentration grants to “increase or improve services” for English learners, low-income students and homeless and foster children “in proportion to the increase in funds.” That carefully phrased wording has become a source of disagreement. The State Board of Education, reflecting the Brown administration’s perspective, wants districts to focus on strategies and services for closing the achievement gap. Its regulations require districts to identify the amount of money generated by high-needs students and to describe how a district will be spending the money. But the regulations do not require an itemized list of supplemental and concentration expenditures. Some civil rights advocates want a more definitive accounting than the state board requires. The funding law provides a complicated seven-step formula for each school district, charter school and county office of education to calculate the amount and the percentage of the annual increase in the funding formula that must be spent on increased or improved services for high-needs students. There may be gray areas. In the first lawsuit involving the funding formula, the nonprofit law firm Public Advocates and the ACLU of Southern California sued Los Angeles Unified in July 2015, charging that the district was improperly counting money it was already spending for special education services for low-income and English language learners as meeting their obligations for supplemental and concentration dollars. Special education services are funded separately from the Local Control Funding Formula. As of early 2016, that suit had not yet been resolved. State board regulations clarify when money targeted for high-needs children under the LCFF can be used for districtwide or schoolwide purposes or teacher raises. For example, a district could propose using funding for high-needs students to extend the academic day or offer summer school for all students who are behind academically. The regulations assume that when high-needs students constitute at least 40 percent of a school’s enrollment or 55 percent of a district’s students, money can be used for a schoolwide or districtwide program, as long as it’s stated clearly how the money will benefit high-needs students. Money can still be used for schoolwide or districtwide purposes when high-needs students make up less than 40 percent and 55 percent of students, respectively. But the burden of proof is higher. The money must be “principally directed towards” the high-needs students and be the “most effective” option in meeting the district’s achievement goals for them. In June 2015, Superintendent of Public Instruction Tom Torlakson issued guidance on when supplemental and concentration dollars could be used for across-the-board raises for teachers. Some districts and children’s advocates have taken the view that such a use would run contrary to the intent and spirit of the funding law. One program that gets special attention in the new funding formula is the state’s former Class Size Reduction program, which since 1996 had offered districts financial incentives to reduce kindergarten through 3rd-grade classrooms to 20 students. In recent years, as a result of the state’s budget crisis, K-3 class sizes in most districts have increased to more than 20 students – and in many cases have reached 30 students or more per class. Under the new system, school districts are provided with a substantial financial incentive – 10.4 percent additional base funding per student – to reduce the student-teacher ratio in transitional kindergarten (TK) to grade 3 classrooms to a maximum average of 24 to 1 in each school in a district. Districts have the full eight-year transition period to full funding to do so. During the transition period, districts must move steadily toward reaching the 24:1 student-to-teacher target in proportion to the percentage of full funding they’ve received. For example, a district that had 33 students per teacher in the first year of the formula should have class sizes no larger than 27 students per teacher in 2015-16. The failure of one school to meet the required class-size ratio in the transition period as well as at full funding will jeopardize the additional money for all schools in a district. In 2015-16, that would mean a loss of $380 per student in a district. However, a significant exception to this requirement is that the funding law allows a district to waive the mandated class-size restrictions and establish larger class sizes if its teachers union agrees to it as a part of a new or renegotiated contract. The new funding formula will comprise between 80 and 90 percent of funding allocated for K-12 schools. It will vary depending on how much is available each year as determined by Proposition 98. To protect some districts from a potential sudden loss of revenue as a result of the new formula, districts are continuing to receive money they previously got through two large categorical programs totaling $1.3 billion. Home-to-school transportation: Districts receiving these funds must continue to spend them on transportation at the level of service provided in 2012-13. Like other categorical programs, the formula had become outdated and hadn’t increased funding for fast-growing districts. A bill calling for a fairer formula and more money for transportation failed to pass in the Legislature in 2015. Targeted Instructional Improvement Block Grant: These funds were originally intended to underwrite the costs of court-ordered desegregation programs in districts that signed up for the money. In most cases these desegregation programs are no longer in effect, yet districts are still receiving the funds. They are free to use them as they choose. Because districts will not receive yearly inflation adjustments for either of these “grandfathered” programs, their value is eroding over time. Approximately 10 percent of state education funds allocated annually through the Proposition 98 formula for K-12 schools do not go to districts under the Local Control Funding Formula. These include funds for special education, along with a dozen smaller programs, including child nutrition, foster youth services, and after-school programs established in 2002 under Proposition 49. Districts will continue to receive these funds in addition to money they will receive through the new funding formula. “Basic aid” districts will receive no money from the state because they get more funding from local property taxes than they would from the formula. They comprise about one in nine of the state’s nearly 1,000 districts, a number that varies from year to year. Many are wealthy districts with high residential property values. However, basic aid districts must still comply with the state’s new accountability requirements, including completion of an annual Local Control and Accountability Plan. And they must spend supplemental and concentration dollars on high-needs students equal to the amount they theoretically would have received had they been funded by the state through the funding formula and not by local property taxes. Federal regulations governing the use of federal Title I funds intended for low-income children will remain in place. Districts have used Title I money for a range of purposes, including extending the school day, training teacher, and hiring specialists and instructional coaches for English learners. Also remaining in place are requirements for districts to satisfy the terms of the Williams v. State of California lawsuit, settled in 2004. The settlement includes the requirement that all students in the state’s lowest-performing schools have current textbooks, access to clean and safe buildings, and fully credentialed teachers. Districts must describe the actions they will take to ensure compliance with the Williams requirements in their Local Control and Accountability Plans. Folding billions of dollars of previously restricted funding for dozens of specified programs into the funding formula provided revenue to distribute more money to high-needs children. It also marked a sharp shift in control over budget and policy decisions from Sacramento to local school boards. On paper at least, local school boards had run California schools. But with the passage of Proposition 13 in 1978 limiting local school districts’ ability to levy property taxes, power over school funding shifted to the state government. Along with more concentrated state power came dictates in the form of an ever-expanding state Education Code, interpreted by an army of consultants and lawyers. Under the Local Control Funding Formula, districts have broad discretion over how to use the base grants. However, in return for that flexibility, districts must commit to raise student achievement. Regulations that the State Board of Education passed in November 2014 require districts to describe how they are allocating resources to improve student results. They also require districts to account for how programs and services for high-needs students will be increased or improved, including when those services are provided to all students schoolwide or districtwide. The funding law ushered in a fundamental shift in decision-making and accountability in California. It requires that, in return for greater control over how they spend state funds, school boards must first reach out to parents, teachers, students and community members for their perspectives on student achievement and school improvement. Having considered what they heard, they must write an accountability plan, called the Local Control and Accountability Plan or LCAP, which describes how local districts will improve student outcomes. In organizing their LCAPs, districts must use the template that the state board created. The state Department of Education is designing an electronic version with various automated features that may be ready for 2016-17. The LCAP is a three-year improvement plan that must be updated annually by July 1. A district then forwards the adopted LCAP to the county office of education for review and approval. In an LCAP, districts must itemize goals to meet each state and local priority for all students and for each student group, including students with disabilities, students who have been redesignated as fluent English proficient, and students in defined racial and ethnic subgroups. Districts must spell out actions, services and programs to achieve the goals, how much they will cost and the metrics to measure the progress. For students generating extra money under the funding formula (low-income children, English learners and foster and homeless youth), LCAPs must specifically state how the actions and spending will increase or improve services – at a minimum, in proportion to the increased funding they generate. 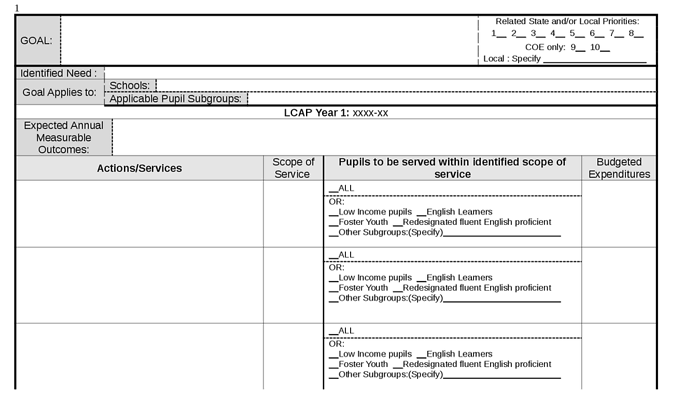 The LCAP is a district-level document. If a district has goals for specific schools, it must specify actions, services and spending relevant to that school. The template includes a separate section for annually updating the goals and progress toward meeting them. In an annual update, a district reports back on whether targets were met, actions were taken and expenditures were made. The update allows districts to modify previous strategies and actions to be more effective. The initial LCAP, in 2014-15, was done on a compressed schedule and was, in effect, a trial run. The 2015-16 LCAP was the first to include an annual update. The 2016-17 LCAP marks the third and final year in the first three-year rolling plan. The Legislature specified nearly two dozen metrics that must be addressed in the LCAP, including rates of absenteeism, suspension and graduation from high school, and success on Advanced Placement exams. Following a two-year hiatus in giving standardized tests in most subjects, students in grades 3-8 and grade 11 took the initial Smarter Balanced tests in English language arts and math in spring 2015. 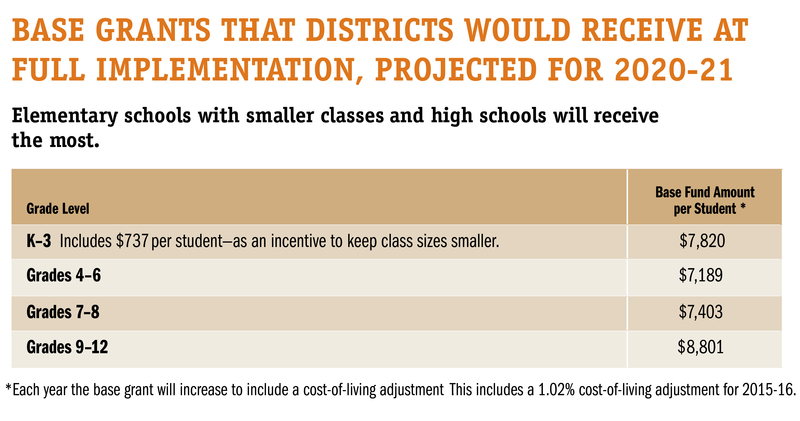 The results, released in September, can factor into goals that districts set in the 2015-16 LCAP. The funding law requires that a school district document how it reached out to parents (including guardians of foster children), community members, teachers unions and students. Although not dictating how districts should do this, the template’s guiding questions imply that the engagement should be genuine and comprehensive. Did the engagement occur early in the process to allow for meaningful discussions? What information and metrics did the district provide parents and members of the district advisory committee? What changes were made to the district’s LCAP as a result of the suggestions it received? Did it listen to school site councils, which will continue to meet and make recommendations for their schools as before? The LCAP requires that districts set annual goals for students covering multiple areas of school and student performance that fall within eight broad priorities (10 for county offices) set by the Legislature and any local priorities. One goal can address more than one priority. For each goal, there is a table with boxes to indicate which student groups the goal will apply to; whether it will apply to all or individual schools; the actions or services to achieve the goal; expenditures, and metrics to measure annual progress. The district must indicate where the services will be targeted to specific student groups. Did the actions and services meet the needs of all students, including each specific student group (not just those getting extra money) and achieve the desired outcomes? What qualitative and quantitative measures were used to review progress in meeting goals? What information did the district use to set goals and address priorities? Were the unique needs of individual schools considered? What’s the reason for the difference in the budgeted and actual expenditures? Because of the paperwork involved in addressing the needs of various student groups and updating each goal annually, the 2015-16 LCAPs in many districts became much longer and more complex. An EdSource analysis of the 30 largest districts found that the average 2015-16 LCAP was 145 pages, compared with 54 pages the previous year. The funding law includes a seven-step calculation for determining the minimum amount of money districts must spend on high-needs students each year in the transition to full funding. That amount equals a “proportionality” percentage of total funding under the formula. The steps are listed on pages 3-4 of the template. For the sake of transparency, a district should include the calculation in an LCAP appendix or on its website. Districts must cite the amount of additional funding and describe how they plan to use the money. If some of the money is used for schoolwide or districtwide purposes, districts must justify why it’s the best use of the money for high-needs students. In a separate box, districts must cite the proportionality percentage and explain how the services provided for English learners and for low-income, foster and homeless youths will improve at least in proportion to services for all students. Districts are not required to list the expenditures for high-needs students. They have the option of using a “quantitative and/or qualitative description” of how services for those students will proportionally increase. This wording has been ­a point of contention between the State Board of Education, which passed the regulations, and children’s advocacy groups and some legislators, who have called for a detailed accounting so that the public could verify that all of the dollars were spent on the children who generated the money. The state board maintains that focusing on expenditures misses the point; the LCAP’s focus should be on actions to improve and increase services and programs in proportion to the money received. The Legislature gave its perspective when it passed Assembly Bill 104, the trailer bill explaining provisions of the state budget, in June 2015. Lawmakers expressed their intent to require all districts – after full funding is reached – to report to the state how much supplemental and concentration dollars they received yearly, dating back to the passage of the funding law, and how much they spent on high-needs children each year. The LCAP groups the state’s priorities – eight applying to districts and charter schools and 10 applying to county offices of education – into three categories (see page 10 of the template for exact wording). Basic school conditions (Priority 1), including the assignment of fully credentialed teachers to appropriate courses, access to standards-aligned textbooks and materials, and safe and clean facilities. Implementation of state standards (Priority 2), including the Common Core and the Next Generation Science Standards for all students, and implementation of the new English Language Development Standards for English learners. Access to a broad course of study, including courses required for high school graduation (Priority 7): Measures may include availability of courses required for admittance to a four-year state university and career-technical education programs. Student achievement (Priority 4) as measured by performance on standardized tests; the percentage of English learners who are reclassified as fluent in English; the share of high school students who pass Advanced Placement course exams with a score of at least a 3 out of 5; the portion of students deemed college-ready on the Early Assessment Program, and other measures of college and career preparation. Other student outcomes (Priority 8) as measured by performance in other required areas of study, including student portfolios and other forms of assessments, such as the SAT or ACT college entrance exams. Student engagement (Priority 5) as measured by graduation and middle and high school dropout rates, chronic absenteeism and attendance. Parent involvement (Priority 3) as measured by efforts to solicit parents’ participation in school-site decisions. School climate (Priority 6) as measured by suspension and expulsion rates, and other local measures such as surveys of students, parents and teachers to measure a sense of safety and feelings of being connected to the school. The funding law lays out the minimum requirements and the State Board of Education has added guidelines for reaching out to parents, students and community members during the LCAP development process. After the LCAP is written, the district superintendent must present it to a District Parent Advisory Committee – a majority of whose members are parents and guardians, including parents of students who are from low-income families, are English learners, or are homeless or foster youth. The superintendent must also present it to an English Learner Parent Advisory Committee if English learners constitute at least 15 percent of a district’s enrollment and at least 50 students. The superintendent must respond in writing to the advisory committees’ suggestions. School boards must hold at least one public hearing on the proposed LCAP before subsequently adopting it at the same school board meeting at which the district’s budget is also adopted. Beyond the minimum levels, parents on their own can press their school boards for more community involvement. For engagement to work as the law intended, the superintendent and school board should do extensive outreach and integrate priorities suggested by the district advisory committees, school site councils, parents and the public at large into the LCAP. Parents who are not directly involved at a district level can participate in discussions with their school site councils. They can insist that LCAP materials and meeting schedules be widely distributed and translated into Spanish and other languages. They can request that the district hold parent trainings on school budgeting and on LCAP requirements. Parents can press the district to begin the outreach early in the school year. Because LCAPs can be very lengthy, parents can request clearly written and accessible summaries that explain how money will be spent. “Reimagining Parent Engagement in California,” by Families in Schools, a nonprofit based in Los Angeles, offers parents a checklist to measure effective outreach. In a February 2016 report, “Ready Or Not: How California Districts Are Reimagining Parent Engagement in the Era of the Local Control Funding Formula,” the organization includes practices that successful districts are doing. The new funding plan includes a significant role for county superintendents, who will annually review all district LCAPs and annual updates in their regions. The county superintendent will verify that each district’s LCAP complies with the requirements for the plan set by the Legislature and State Board of Education, and that the district’s budget reflects the plan’s goals. The district must send the plan to the county superintendent within five days of adopting it. The county superintendent has until Aug. 15 to seek clarification about the plan. The district governing board then has 15 days to respond to the county superintendent’s request for clarification. The county superintendent has another 15 days to submit recommendations for amendments to the plan. The district must consider those recommendations at a meeting of the school board. The county can either approve the plan by Oct. 8 each year or reject it for failing to comply with state requirements and work with the district to improve it. In order to encourage consistency in monitoring LCAPs among the state’s 58 counties, the California County Superintendents Educational Services Association has produced a manual for LCAP review and created a steering committee to discuss common issues. Many county offices have been proactive to head off potential problems by conducting LCAP development trainings, going over early LCAP drafts, and holding countywide meetings on model practices and innovative approaches to school improvement. Nonetheless, some districts have reported variations among county offices in interpreting and enforcing LCAP regulations. 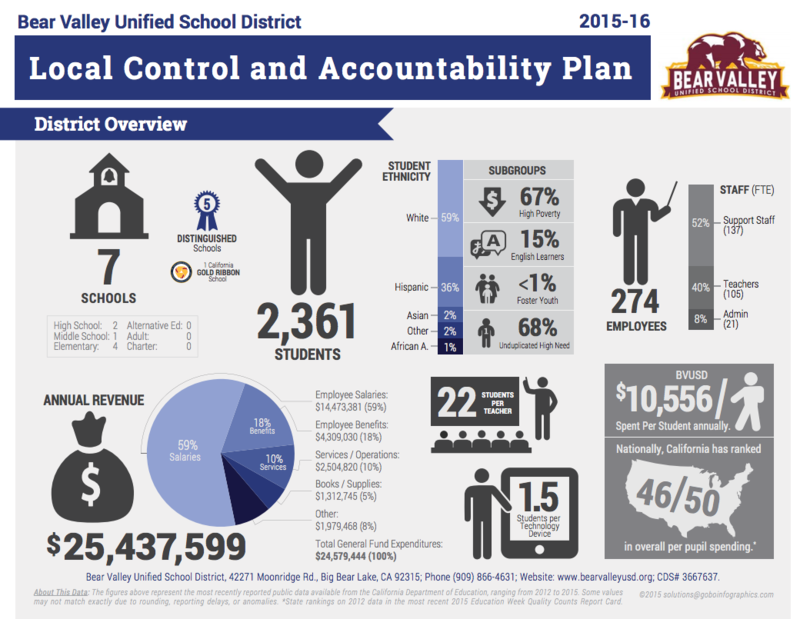 County offices are also spreading the word about districts that have made their LCAPs more comprehensible through executive summaries and illustrations, such as Bear Valley Unified’s infographic for 2015-16. Districts under the Local Control Funding Formula have considerable latitude to decide how to spend money for basic services and for high-needs students. The thrust of the new system is to encourage self-improvement and to provide support to schools that fail to show progress in the eight LCAP priority areas. This marks a big shift from the sanction-oriented, prescriptive approach of the federal school accountability system under the No Child Left Behind law. For more than a decade, the state measured and ranked performance primarily through the Academic Performance Index, a three-digit number based on schools’ and districts’ standardized test scores. Since 2013-14, the State Board of Education has suspended the API and has been developing a new school accountability system with broader measures of the eight priority areas from 23 data elements that the Legislature laid out for school districts and charter schools in the Local Control Funding Formula. They are a mixture of statewide metrics for which data already is being collected, plus some local metrics yet to be defined. State board members have compared these multiple measures to the gauges on the dashboard of a car; the funding law calls them “evaluation rubrics” and requires three sets of them. Self-assessment rubric: The state board has until the fall of 2016 to create the first set – a “self-assessment rubric” to help districts and charter schools take stock of their strengths and weaknesses when they set goals and measure progress in their LCAPs. Support rubric: The self-assessment metrics – or a subset of them as determined by the State Board of Education – will guide county offices of education in providing support and assistance. The funding law says that a county office must provide some form of assistance if it determines that a school district does not improve outcomes in more than one state priority for at least one subgroup. The county office would assign an expert to work with the district on its weak area, could request help from the California Collaborative for Educational Excellence, or could do its own analysis and suggest research-based corrective actions. Intervention rubric: Likely a handful of statewide metrics, this rubric will instruct the state superintendent on when state intervention in an underperforming district is warranted (see the section "When is state intervention required?"). The funding law says the rubrics are supposed to establish “a holistic, multidimensional assessment” of district and individual school performance. They will include statewide standards of performance and expectations for growth and improvement for all students and various student subgroups. The State Board of Education has contracted with the research agency WestEd to help develop the rubrics and gather feedback on early drafts from practitioners and stakeholders throughout the state. You can follow the progress and draft proposals here. “The goal of the evaluation rubrics should be self-improvement, not punishment, with outside intervention as a last resort,” said Michael Kirst, president of the State Board of Education. The Legislature established the California Collaborative for Educational Excellence as an autonomous state agency to “advise and assist” school districts and charter schools in achieving the goals in their accountability plans, to improve the quality of teaching and to build district and school leadership. It will also have a hand in deciding which persistently underperforming districts need intervention and what form it will take. The state superintendent or a county superintendent may direct the collaborative to assist a district or charter school. Or a district can request help to focus on a specific need, such as enhancing school climate, improving an area of instruction or building district leadership. As its name implies, legislators want to create a more collegial, cooperative approach to school improvement – not impose fixes on districts. Carl Cohn, retired superintendent of Long Beach Unified and former State Board of Education member, was appointed the collaborative’s first executive director on Aug. 6, 2015. Since then, he has been soliciting ideas on how it should operate. He has said the agency will have a small staff and will not become “another state bureaucracy.” Among the ideas he is exploring: pairing schools needing help in an area with those with expertise and encouraging networks of schools and districts to collaborate on issues. Since the State Board of Education won’t adopt the evaluation rubrics until fall 2016, the collaborative’s role in any potential interventions won’t kick in for several years. In December 2015, Cohn announced the hiring of four top administrators to oversee the agency’s work. The State Board of Education approves the state superintendent’s intervention. Charter schools are covered by the Local Control Funding Formula, which for the first time provides funding based on a uniform formula for charter and district schools with students from similar backgrounds. Like districts, charter schools will receive a base grant per student plus additional supplemental and concentration grants based on the number of high-needs students enrolled. There is one key exception, however. A charter school’s entitlement for the concentration grant bonus will be capped at the percentage of high-needs students in the district where the charter school is located, not on the percentage of high-needs students it serves. State officials explain that the intent of this provision is to eliminate any financial incentives to convert traditional public schools with high enrollments of low-income students or English learners to charter schools in order to benefit from the funds that those students would bring to the school through the new funding formula. They believe this could lead to a further concentration of minority student populations. Some charter school leaders have expressed unhappiness that a charter school’s funding will, in part, be determined by their district’s student demographics, rather than the demographics of the charter schools themselves. For example, a K-5 charter school serving 90 percent low-income and other high-needs students would receive no concentration grants in San Jose Unified, where the enrollment of high-needs students in the district overall is under the 55 percent threshold needed to qualify to receive those grants. If the same school were located just across the district’s boundaries in the Franklin-McKinley School District, where 80 percent of students fall into a high-needs category, it would receive more than $900 per student in additional funding. Charter schools will automatically receive the 10.4 percent additional base funding for students in grades TK-3 as an incentive to reduce class sizes to a maximum of 24:1 in those grades. However, unlike school districts, charter schools will not have to prove they have met or are working toward that target to get the additional funding. Charter schools, like school districts, must complete a Local Control and Accountability Plan, updated annually by the charter school’s governing board. They must also consult with parents, teachers and students in creating it. However, they do not have to follow the law’s requirements for engaging the public, and they don’t have to hold two public hearings required of districts for the adoption and update of the plan. They also don’t need the approval of the county office of education. Interventions and supports for charter schools are also different. Charter schools, like districts, will have their performance measured against sets of criteria or rubrics that the State Board of Education will adopt by the fall of 2016. These rubrics will be based on the eight priority areas cited earlier. Persistently failing charter schools must receive help either from the district that granted them their charter or, at the discretion of the state superintendent, from the newly authorized state agency, the California Collaborative for Educational Excellence. Charter schools are subject to the same standard used to determine whether a school district requires intervention – if they fail to improve the performance of their students in three out of four years for three or more subgroups of students in more than one of the eight state priority areas. The school has not been able to carry out the collaborative’s recommendations. The school’s performance is persistently poor. But analyses by the Education Trust-West, the ACLU and the Legislative Analyst’s Office also found areas in need of improvement and of serious concern. Many LCAPs included spending only on the eight priorities and did not account for the full LCFF funding or for base spending. It was difficult to track how supplemental and concentration dollars were spent, and to distinguish between continued spending for existing programs and spending for new programs and initiatives. Many districts did not explain the rationale for using supplemental and concentration dollars for districtwide purposes. Many districts grafted what they had been doing onto the LCAP’s eight priorities without envisioning alternative ways to approach school improvement. The California Collaborative on District Reform, in a December 2015 report, called for clearer guidance from the state board about expectations for the LCAP and for replacing the current template with alternative methods for districts to communicate goals to the public. After interviewing dozens of district and county officials, school board members, parents, and teachers, researchers Julia Koppich, Julie Marsh and Dan Humphrey, in a December 2015 study, found continued enthusiasm for local control tempered with worry that the LCAP was becoming more an exercise in compliance with state law, and less one dedicated to improving education outcomes. They too called for changes in the LCAP template and for school board members to become more involved in the creation of the LCAP. Extremely long LCAPs discourage examination by the community they were intended to serve. In the agenda for its November 2015 meeting of the state board (a section of Agenda Item 11), the state Department of Education highlighted districts that have responded to the length problem by creating executive summaries, blogs and dashboards. Among the districts that summarized their LCAPs with infographics were Bear Valley Unified and West Contra Costa Unified. State board members indicated they will encourage summaries and creative ways to explain what’s in an LCAP, but have no plans to modify the template or require additions to it. In its analysis of the LCAPs, the non-partisan Legislative Analyst’s Office suggested that districts be permitted to focus on highest-priority areas and critical areas in need of improvement, rather than all eight state-required priority areas. Bear Valley Unified created an infographic to highlight its LCAP. This is one way that districts can summarize a lengthy and complex document for parents and teachers. California has embarked on a bold experiment to simplify its complex, opaque and inequitable system of school funding and to target additional money to students most in need. As the state’s economy has improved, the average amount the state spends on each student from Prop. 98 funds has increased substantially (from $7,008 in 2011-12 to a projected $10,591 in the Governor’s Budget Summary for 2015-16). However, even at full implementation of the new formula, average per-student funding will continue to lag behind many states, in some cases by thousands of dollars. The Local Control Funding Formula is a mechanism for redistributing state general funds guaranteed by Prop. 98, not a source of new funding. There is also no assurance that the additional supplemental and concentration dollars will result in improved student achievement. However, the new system does offer school districts more control than they have had in decades to run schools as they deem best. And requiring school boards and local education leaders to be more transparent provides parents and the community new opportunities to educate themselves and actively help shape spending decisions and academic priorities. Many details about how the new system will work will be answered during the next several years. The challenge is to ensure that the new funding system results in improved outcomes for all students – and especially for high-needs students whom the new system targets for extra help. Sources for graphics: California Department of Education, California Department of Finance, Legislative Analyst’s Office and School Services of California. EdSource thanks Edgar Cabral, K-12 analyst for the Legislative Analyst’s Office, Brooks Allen, former deputy policy director and assistant legal counsel for the State Board of Education, and Ian Johnson, with the Department of Finance’s Education Systems Unit, for reviewing sections of this guide. General Information on LCFF and LCAP, California State PTA (available in six languages). Fair Share 4 Kids, A coalition of advocacy groups and nonprofits: database of how much each district gets in supplemental/concentration dollars. LCAP Toolkit, Education Trust-West, Children Now and the California Association of School Business Officers : tools to help school districts and advocates create readable LCAPs and budget presentations. CDE website, California Department of Education: LCFF overview, regulations, FAQ, funding information. LCAP trainings, Sacramento County Office of Education: slides, information from December 2015 workshops on funding requirements. California's New Finance Law, Public Advocates: links to organization's commentaries, resources.